Oslo National Academy of the Arts organizes a week focusing on artistic research from 22 to 25 January. The programme consists of workshops, presentations, round-table discussions, screenings, exhibitions, artist talks etc. See information and videos from Artistic Research Week 2018. Artistic research is an integrated part of the activities at Oslo National Academy of the Arts. The Artistic Research Week shall contribute to a wider understanding of the research going on, and also increase the discursive level on artistic research, sharing experiences, insights and knowledge that is generated through practice-based research with faculties, students and a wider audience. The programme – with a few exceptions – is therefore open to the public. New this year is a collaboration with Kunstnernes Hus. Moonologue is a new opera produced in collaboration between composer Katinka Fogh Vindelev and visual artist Marie Kølbæk Iversen, which will be performed at KHiO on January 21st – the first full moon of 2019. The opera is an independent continuation of Kølbæk Iversen's long-term art project Io/I forming part of her artistic research project "Neo-worlds: the transformative potentialities of fright" at KHiO. In the opera's libretto, written by Kølbæk Iversen, the diverging identities of Io is explored: Io is Jupiter's inner-most moon, which was discovered in 1610 by Galileo Galilei, but she is also the Greek-Roman mythological priestess after whom the moon is named. Through Galileo's Italian ('io' is the Italian word for 'I') the different manifestations of Io are synthesized into a composite Self; a Self thus also encompassing Galileo as well as the artists – the audience even; a Self which speaks through the Moonologue. In her composition of Kølbæk Iversen's text, Fogh Vindelev takes as her starting point this blurring of identities, which she reflects in the two voices – a male and a female voice, a countertenor and a soprano (sung by Morten Grove Frandsen and Fogh Vindelev herself) – that intersect and diffuse each other beyond the singers' cultural and biological genders. The composition shifts between recitative and abstract parts together reflecting the hybridizing, supernatural, and mythic elements of the text. The opera premiered at Louisiana Museum of Modern Art (Humlebæk, DK) at full moon on November 23, 2018. On this occasion, the opera was released as a limited vinyl edition by Antipyrine Records. The project is realized with the kind support from Louisiana Museum of Modern Art, the Danish Arts Foundation, the Novo Nordisk Foundation, and the Norwegian Artistic Research Programme. Marie Kølbæk Iversen: PhD fellow in artistic practice at the Academy of Fine Art at Oslo National Academy of the Arts and Aarhus University since 2017. Visual Artist MFA from the Royal Danish Academy of Fine Arts in 2018. In 2018 part of "The Moon" at Louisiana Museum of Modern Art with the large-scale video installation Io/I. In 2017 recipient of ARKEN's travel grant as well as the NARP- and Novo Nordisk Foundation Mads Øvlisen-grants with special mention. In 2016 participant in the 11th Gwangju Biennial "The Eight Climate (What Does Art Do?)" and artist-in-residency at Pivô in São Paulo, Brazil. Represented by Gether Contemporary. Katinka Fogh Vindelev: Post-graduate in classical singing the Danish National Academy of Music since 2018 and MA in electro-coustic composition and Sound art in 2017. BA in Classical singing from The Royal Academy of Music in 2012. Since 2012, lead singer and composer in the sound collective/quartet We like We. Pianist and singer on Efterklang's world tour (2012-14); soloist at the Odense Symphonic Orchestra's premiere of Karsten Fundal's Liquid Rooms (2014); playing the role of Young Isolde in Sort/Hvid's thriller opera LEAVES (2015). In the context of the research week at KHIO the PhD candidates from the department of dance come together in a self-organised seminar. In 2016 we were for the first time four researchers in dance at KHIO. This gave the occasion to meet as a group of researchers within a shared field of practice. In the larger context of the Norwegian Program for Artistic Research we have the opportunity to share and exchange across disciplines and institutions. This seminar allows us to look from a specific angle upon the research of each one, across the years or stages of our respective projects. What questions do we share? Is there a specific knowledge that we share and build upon? Where can our experiences feed into each other? This year we will be five candidates. One will just have begun, and one is almost finished. Like last year, we start the seminar with one day dedicated to each one of us in a closed session, and with a moderator. The second day will be an open discussion with moderator where we discuss what came up during the seminar and what we feel important to share from our experience. Professor of Dramaturgy at the Academy of Dramatic Arts, University of Zagreb. Dramaturge, co-founder and member of BADco. performing arts collective. Program coordinator in Centre for Drama Art (CDU) from 1995 till 2007. One of the initiators of the project Zagreb - Cultural Kapital of Europe 3000. With his projects and collaborations (BADco., Frakcija) participated at Venice Biennale 2011 and 2016, Documenta 12, ARCO and numerous festivals and conferences. He is/was mentoring and teaching at DOCH (Stockholm), JLU (Giessen), Statens Scenekunstskole (Copenhagen), P.A.R.T.S. (Brussels) etc. Teaching courses in performance dramaturgy, writing for performance, analytical writing, dramaturgy and choreography, collaborative practices etc. First editor-in-chief (1996-2007) of Frakcija, a magazine for the performing arts. The work of Mette Edvardsen (b. 1970) is situated within the performing arts field as a choreographer and performer. Although some of her works explore other media or other formats, such as video, books and writing, her interest is always in their relationship to the performing arts as a practice and a situation. With a base in Brussels since 1996 she has worked for several years as a dancer and performer for a number of companies and projects, and develops her own work since 2002. She presents her works internationally and continues to develop projects with other artists, both as a collaborator and as a performer. A retrospective of her work was presented at Black Box theatre in Oslo in 2015. Mette Edvardsen is structurally supported by Norsk Kulturråd (2017 -2020), BUDA Arts Centre Kortrijk (2017 - 2021) and apap-Performing Europe 2020 - a project co-founded by Creative Europe Programme of the European Union. She is currently a research fellow at Oslo National Academy of the Arts and associated artist at Black Box teater Oslo. Janne-Camilla Lyster (b. 1981) studied at the Oslo National Academy of the Arts, where she graduated with a BA in Contemporary Dance in 2006. She is a dancer, choreographer and author. She has published several collections of poetry, as well as writing literary scores generating choreography through the interpretation of dancers. Her work is presented at theatres and venues including the Norwegian Opera & Ballet, Black Box Theatre, Dansens Hus, Det Norske Teatret, and tours internationally. She is currently an artistic research fellow at the Oslo National Academy of the Arts, The Academy of Dance, with the project Choreographic poetry: Creating literary scores for dance. Ingrid Fiksdal (b. 1982) work as a choreographer based in Oslo. She's currently finishing a PhD in artistic research at the Oslo National Academy of the Arts, with the project Affective Choreographies. The focus of the research project is to explore choreography as affective through the development of specific choreographic methods. She aims to create work that produces potential for altered states, experiences, thoughts and ideas to occur. This is founded in a belief in art as a motor for change, through taking the role as "utterly useless" in a society where most other things have given and known purpose. She says that when we are confronted with something that doesn´t perform as expected or resists classification we have to look for new approaches, and in these moments of liminality there is potential for the unpredictable and unforeseen to occur. Recent pieces include Diorama (2017), STATE (2016), Shadows of Tomorrow (2016) and Cosmic Body (2015). The work has toured extensively in Norway and Europe, as well as to the US and China. Deep Field (2018), which premiered at Black Box Theatre on the 7th of November 2018, marked the end of her PhD. From 2016 to 2020 the artist is supported by apap-Performing Europe 2020 – a project co-funded by Creative Europe Programme of the European Union. Her work receives base funding from the Norwegian Arts Council. Brynjar Åbel Bandlien (b. 1975) trained ballet in his native Norway and at the Hamburg Ballet in Germany Bandlien worked as a modern dancer for Netherlands Dance Theatre 2 in Den Haag with which he toured Europe, the US and South-Africa. In 1998 he started to work as a freelance dancer in Scandinavia, Europe and the US working with artists such as Philipp Gehmacher, Raimund Hoghe (dramaturg of Pina Bausch), Vera Mantero og Antonija Livingstone. He has also presented his own work at Black Box Theatre, Dansens Hus Oslo and Henie Onstad Kunstsenter and at festivals in Brussel, Bologna, Belfort, Bucharest, Berlin and New York. Currently he is a PhD fellow of artistic research at Oslo National Academy of Art in Norway. Rosalind Goldberg graduated from the MA program in choreography at HZT Inter –University Center for Dance Berlin 2014 and from Balettakademien in Stockholm 2007. The Ph.D-project "Choreography as a meaning-generating aggregate"
The focus of my research project is to examine choreography as an aggregate which can stimulate and challenge the understanding of the body alongside being an incentive to language. By placing the body in the centre, I want to highlight its capacity as an active meaning-generating apparatus other than language. My research draws on the interdisciplinary field of New Materialism in which the material, the bodily fleshiness and the discursive-linguistic, are thought together. Linking its theories to my choreographic work I want to stress that meaning is something that can be sensed and something that not only operates through the medium of language. A feeling of coherency can give an experience of meaning, though it is not yet translated to language. Living in a time when things are valued through their efficiency and functionality, meaning is often reduced to information bound to language. Through creating choreographic methods and in extension choreographic work, I will in this research project materialize ideas and expand their possibility of expression to penetrate the habit of sensing and perceiving. Working with choreography and dance, I see this as one of their main capabilities. To bore through habitual veils of perception, to maintain something persistently in order to make a slight shift in how one understands things. My starting point is that art criticism is in need of new optics, and that an anthropological approach must be integrated to complement the established art historical and critical-theory-informed approach. The advantage of focusing on design as an entry to this is twofold; First, there is no established design criticism, so it is perfectly legitimate to propose something new – and secondly, anthropology is already an integral part of the academic theory base for design research, as design as a phenomenon is not just about intention but also about its impact-in-the-world. However, the need for such an approach is evident in much of the more agency-oriented contemporary art, so-called post-art, not to mention in enabling critics to tackle decolonizing perspectives or to produce relevant criticism in the antroposcene for that matter. I was fortunate to work with art historian Erlend Hammer on writing about this - we have had a dialogue going for almost a decade with a great deal of overlap about alternative perspectives, so it is about time we got something produced together. Charlotte Bik Bandlien is an Oslo-based anthropologist specialized in visual and material culture. Triangulating the roles of researcher, collaborative practitioner and teacher, her interdisciplinary research revolves around contemporary conditions for constructing criticality, currently focusing on dialectics between contemporary art, advertising, anthropology, and speculative perspectives. Work presented at Museum of Modern Art in Warsaw, Parsons the New School for Design in NYC, Oxford University, Design History Society, College Art Association, Theaster Gates' Arts Incubator in Chicago, American Anthropological Association, the material culture hub at University College London, Tate Research and Learning/AAH ++ Assistant professor of theory and methodology at the Oslo National Academy of the Arts, Department of Design, since 2011. Erlend Hammer is an art historian and curator who lives in Oslo. Former critic at Kunstkritikk, Billedkunst and Dagbladet. Since 2016, Senior Specialist at Blomqvist Kunsthandel. Fans of electronic dance music often speak in terms of "PLUR" (peace, love, unity, respect) to describe their favourite scenes. In this presentation, Tami Gadir will address such claims in relation to her forthcoming book, which argues that such utopian dance floors are the exception, not the rule. Clubbers physically harass others based on gender and racial prejudices. Booking agents use myths about merit and artistry to justify their under-booking of women, transgender, and non-binary DJs. And music technology corporations contribute to an inequitable labour market by outsourcing their manufacturing to free-trade zones in the developing world. Grounded in field work, the accounts of dance music participants across the globe, and a feminist conceptual perspective, this presentation argues that even so-called underground club cultures–-like all musical cultures, and indeed, all of human culture–-are bound up with the social injustices of a global free-market. Tami Gadir is commencing a lectureship in music industry at the School of Media and Communication at RMIT University in Melbourne, Australia. Gadir was a postdoctoral research fellow at the University of Oslo from 2015 to 2018, and holds a PhD from the University of Edinburgh, where she worked under the supervision of Simon Frith. Gadir has a background in classical piano performance and composition. Her research addresses the mechanisms that promote or hinder participation in musical cultures, explored primarily through the sounds, technologies, and cultures of contemporary, electronically-produced dance music. Gadir addresses such themes in her forthcoming book (Bloomsbury academic, 2019) through eight years of participant observation and interviews with DJs, producers, and clubbers. Gadir is a co-founding committee member of GeMus: Gender and Music Network. Her work as a DJ is integral to her research. Marte Johnslien is a PhD Candidate in Artistic Research in the department of Art and Craft. Johnslien will read from her text The Blue-Green Line in Romlaboratoriet/the Space Lab, accompanied by some of her sculptures. The sculptures are made from steel-reinforced ceramics, a technique MJ is developing as part of her PhD project. The text is about colour in language, colour perception and the materials that colours are made from. It is a speculative text about the connections between perception and the material, and between art and ecology. The presentation will be in English and last for 20 minutes. There are 20 seats available. 14:30: Alistair Payne: The Art of Research: 2nd and 3rd Cycle Degrees. Advancing Practice or What Happens Next? The presentation will be in two parts, firstly focusing upon the movement and distinction between 2nd and 3rd cycle awards within artistic institutions/academies. This will present possibilities and differences between the following modes of study: Master of Art (MA), Master of Fine Art (MFA), Doctorates (PhD), the potential of the Creator Doctus, post-doctoral research and artistic research. This part of the presentation will also open discussion around shared supervision and cross-institutional networks. The focus will oscillate between the professional orientation of some awards and the embedding of research as a mode of practice in its own right in others. In the second and final part of the talk I will briefly introduce my own artistic research, from the perspective of my own personal experiences of an MFA, a PhD and post-doctoral research, and what they have meant to the development of my own artistic practice and writing. Professor Alistair Payne is an artist, educationalist and researcher and is currently the Head of the School of Fine Art at the Glasgow School of Art. The presentation will describe and discuss a recently initiated research project at the Royal Danish Academy of Music. The project is called Learning Art (in Danish: Kunst og læring), and it consists of four Ph.D.-projects covering different fields of knowledge at the academy and a senior research project gathering the findings and developing a conceptual framework for project as a whole. The purpose of the project is twofold: First of all, to focus on the specific kind of knowledge and pedagogical skills it takes to bring out the individual artistic expression in the students at the academy, and second to gain knowledge as an institution in education on third cycle level and in working with research on a collective and cross disciplinary level. In my presentation I will talk about the scientific as well as the institutional purpose of the project and also about the practical challenges of carrying out a project of this kind in an artistic institution as The Royal Danish Academy of Music. Anne Gry Haugland, Ph.D., Associate Professor at The Royal Danish Academy of Music in Copenhagen with special focus on Artistic Research and critical reflection. This session includes a brief introduction to Petrine Vinjes artistic research project, Transforming Memories. On the potent of the Materiality, the Motif and Consciousness through Touch and is followed by a presentation by Martijn van Beek (Aarhus University). The aim of this afternoon session would be to look upon similarities between artistic and contemplative practices, and outline directions for future research on the topic. This session will invite to further discussions on the potent of the Materiality, and its connections to the neurophysiological system, emphasizing the self-organizing powers of several nonhuman processes in relationship with the human sub-conciousness. The session will present and explore in practice micro-phenomenological research methods that aim to help people become aware of the micro-gestures and synchronic and diachronic dynamics of experience in contemplative practices and art-as-practice. What do we do, exactly, when we engage in a contemplative or artistic practice? What happens in our body, our sense perceptions, our mind? What similarities, if any, are there between contemplative and artistic practices and how may microphenomenology help us identify them? Petrine Vinje was appointed the Artistic Research Fellowship at the Oslo National Academy of the Arts (KHiO), Department Art and Crafts in 2018. Lately Vinje was the subject of a solo exhibition at Fotogalleriet (2018) where she showed the installation Depot, a sensorial installation addressing historical paradigmatic shifts connected to personal collapse, developed in collaboration with Phd. Candidate Tejaswinee Kelkar (NMH). Most recently Vinje also published the book Anthology – Anatomical Theatre, a result of a project where she invited scholars and artists to contribute in a vast associated programme, set in a replica of a dissection theatre from the 1500s (Anatomical Theatre, 2013). Vinje has finalized temporary and permanent commissions in public space, such as for the University of Oslo, where she produced a sculptural installation for Blindern Campus and co-curated the international conference The Power of Motifs in connection. In 2014 Vinje conducted the interdisciplinary project AGLA HAGLA – examining the National Runic Archive's content and sources – under the Arts Council Norway's initiative What is the Archive?, which resulted in a publication and exhibition at the Museum of Cultural History in Oslo. She has participated in a number of group exhibitions both locally and internationally and held solo exhibitions in Norway at Fotogalleriet (2018), Tegnerforbundet (2017), Kunstnerforbundet (2009), Akershus Kunstsenter (2011) and SOFT galleri (2011). Martijn van Beek (Ph.D., Cornell 1996) is an Associate Professor in the Department of Anthropology and affiliated with the Interacting Minds Centre at Aarhus University in Denmark. He lived and worked among Tibetan Buddhist communities for extended periods since the early 1980s, particularly in Ladakh. His earlier research examined the nexus between development, religious identification and the dynamics of communal conflict. Among current projects, he is involved in a multidisciplinary collaboration exploring the potential of microphenomenological methods for contemplative research, teaching and practice, and in a collective project on "Ethics after Individualism". Together with other members of the Danish Society for the Promotion of Life Wisdom in Children, he is also involved in research and practice in contemplative education. Van Beek is a Fellow of the Mind and Life Institute and an active member of Mind and Life Europe. He lives at Vaekstcenteret, an intentional community in Denmark. 14:00: Marie Kølbæk Iversen and Katinka Fogh Vindelev: Gravitational Shift kick-off – creative teaching collaboration between KHiO's opera and fine art departments. This afternoon will feature the kick-off of the course "Gravitational Shift" – a creative teaching collaboration between classical singer and composer Katinka Fogh Vindelev and visual artist Marie Kølbæk Iversen. The course unfolds during the spring of 2019 in collaboration with KHiO's opera and fine art departments. "Gravitational Shift" aims at exploring the transformative and generative – "worlding" – potentials of collective singing, and the course will lead to a public concert on May 14, 2019. For the kick-off on January 22nd, Fogh Vindelev and Kølbæk Iversen will introduce to the course through a line of exercises that interlace collective singing with other forms of non-verbal creative expressions. After a short introduction and warm-up, a guided group improvisation will take place followed by a non-verbal debriefing session. The kick-off thus initiates the creative processes underlying "Gravitational Shift," the focus of which is a composition that will be created by Fogh Vindelev and Kølbæk Iversen in collaboration with course participants on the basis of non-verbal vocal expressions of fright and pain (screams, gasps, cries, etc.). These sounds have been collected by Kølbæk Iversen among birthing women as part of her artistic research project regarding fright. The composition seeks out the melodic rather than affective qualities of fright expressions and invites the participants to sing the melodies rather than reproducing their affect. As such, the course seeks out the power of the aesthetic to reconfigure trauma in ways that verbal narrative direct representation may not. See Information about the Moonologue performance for bios. About The Mark on the Wall Stipendiat Ane Thon Knutsen ved avdeling Design, åpner utstillingen av sitt hovedverk The Mark on The Wall, på Kunstnernes Hus 22. januar. Utstillingen i Resepsjonsgalleriet er relatert til denne. Ane Thon Knutsens hovedverk er det siste av en rekke adapsjoner av Virginia Woolfs novelle The Mark on the Wall, som ble skrevet mens hun lærte seg å sette bly i 1917. Thon Knutsen undersøker i sin PhD hvordan det at Woolf satt bly kan ha påvirket hennes opplevelse av tekst, og leser den fra et boktrykkerperspektiv. Utstillingen inngår som en del av hennes avsluttende PhD arbeid. This show will gather together three phases of work by the Touching the World Lightly team. It will loosely narrate developments from initial explorations, through experiments with the respective artists' drawing processes, locations, materials and contexts, to the present. Comprising works on paper, an artists' book, moving image and examples of writing and process, the exhibition provides a visual insight into the project's trajectory over the last three years. Philippa is a Senior Lecturer in the School of Art, teaching on the MA Craft, and is research lead for 3D Design and Craft and for the Drawing Research and Enterprise Group. Her main research focus is on a range of drawing practices, particularly in health and wellbeing, art and design education and in research. She has an interest in manual drawing that takes place within clinical settings, in the pedagogy of drawing in higher education, the uses of drawing as a visual research method and approaches to arts/health research. Her background is in literary criticism and literature teaching. Duncan Bullen is Deputy Head for Research and Enterprise in the School of Art at the University of Brighton. His research interests are grounded in the materiality of manual drawing. He is particularly concerned with tactile, repetitive, reductive, non-representational drawing strategies which he aligns with the practice of mindfulness meditation. In his research he takes a pragmatic - phenomenological perspective and uses a convergence of thinking from Eastern and Western philosophies and Japanese aesthetics. With this comes an increasing interest in arts-health wellbeing and the reciprocity between practitioner and world. Jane Fox has developed a hybrid arts practice that incorporates drawing, print and installation. Her research interests include walking and drawing and are oriented towards personal narrative, collaborative process and inclusive arts practice. Jane Fox is a Senior Lecturer in Printmaking on the university's Fine Art programme. She is a year tutor and teaches expanded print practice on level 5 of the course, supporting the making and development of studio-based work. Jane also works on the Inclusive Arts Project with Rocket Artists as an artist facilitator and is connected through this work to the MA Inclusive Arts Practice on which she has taught in the past. Tale Næss (b. 1969) is a PhD fellow in playwrighting at Oslo National Academy of the Arts, the Theatre Department. Næss is an award-winning playwright, dramaturge and author living in Tromsø and Oslo. Næss works across the field and often in interdisciplinary constellations. Næss has written novels, plays, poetry, librettos and prose. She has a master in film science. Her work has been produced and performed nationally and internationally. Camilla Bruerberg: The thing in question - thread, surface and beyond. Venue: Stage 2. Other parts of the project on Stage 5 (see details below). Prosjektet utforsker dokumentasjon og formidling av sceniske verk innenfor teater, dans og musikk ved bruk av lydopptak og video. Installasjonene foreslår videreutvikling til nye romlige kunstverk som alternativ til passiv lagring. Dørene til scene 2 og 5 er åpne for publikum i forskningsuka 23.- 25. januar 2019. Kunstnerne vil være til stede. Hvert minutt på jorden i dag tar vi alle til sammen like mange fotografier som det vi totalt tok i hele det 20. århundre. Det påstås at det er en viktigere egenskap for mennesket å kunne glemme enn det å kunne huske, og opplevelsen av et sceniske verk går tapt som alle andre øyeblikk i livet når forestillingen er over. Prosjektet tar inn over seg at avfilmet scenekunst kan være utilfredstillende. LIVE-RE-MAKE prosjektet forsøker å revitalisere video-råmateriale fra tre sceniske produksjoner; én musikalsk komposisjon og to danseforestillinger. Hensikten er å skape nye romlige verk ved å projisere videopptak på tre-dimensjonale objekter/flater. «Phonotope; on paper», Rolf Wallin, komponist. Lyd og bilde fra visuell konsert på KHIO september 2017 med SISU Slagverkensemble og Rolf Wallin. «felt room; on paper» Olive Bieringa/BodyCartography Project, koreograf. «Lineage; on paper» Otto Ramstad/BodyCartography Project, student, master koreografi KHIO. Lyd og bilde fra fra Skjåk i Gudbrandsdalen. Videomaterialet brukes uredigert/ uklippet, (redigeringen skjer romlig). Verket kan reproduseres uten aktører. Verket bygges som installasjon i fullskala eller skalamodell, som helhet eller i utsnitt. Installasjonen bygges på en dag til lave kostnader. Kan fungere i lecture-performance format eller selvstendig installasjon (galleri). Ambisjon er å bevare og tilføre kunstneriske opplevelseskvaliteter i rommet. Både fullskala installasjoner og modellformatet er tenkt knyttet til videreutvikling av prosjekter samt forsknings og formidlingspraksis, seminarer, undervisning. Speeches by: Anne Hilde Neset and Rector Jørn Mortensen. Doktorgradsstipendiat Lisa Lie er regissør for forestillingen Mare ved Det Norske Teatret. Mare er ein tragedie, eit mysterium, ein folkeleg festival i mytologisk landskap. I dette universet vil du møte mange karakterar frå samtid, historie og myte. Ein av desse er den greske myten om Medea. Regissør Lisa Lie har i lag med dei kunstnarleg medverkande og ensemblet skapt eit scenisk verk i spenningsfeltet mellom ei lys handling og ein mørk tekst. Med utgangspunkt i mytar, mellom anna frå antikken, blandar dei historie og samtid med eit urtidsteater som stammar frå dionysiske landlege rituelle festivalar. Since the introduction of "artistic research" as an institutionalised concept both within the practice field and in the university and higher education sector (the academic field), there have been discussions about formats on the findings of the research. Few would argue that art and/or artistic practice is limited – both methodological or epistemological - as a domain for production of insights, erkentnis, experiences, and understanding of man's relation to her social, political, emotional and aesthetic surroundings. But since art operates within different institutionalised frameworks (as is the case with a wide range of practices (law, medicine, engineering etc. ), art and artistic research are faced different expectations from different agents. This is of course old news and has been eloquently investigated by Henk Borgdorff in his book The Conflict of the Faculties (Leiden University Press 2012), where he investigates many of the "conflict lines" between artistic and academic practice. These investigations very often lead to elaborations within theory of science, and in particular; how epistemological investigations can help to understand how artistic practice can serve as explorative and investigating force. To meet the academic criteria listed above and to meet the standards of a practice field must involve some sort of translation. The Frascati manual actually says: "The codification of knowledge and its dissemination is part of the usual practice in universities and research institutes,.."(2.4 Transferability and/or reproducibility, 2.20) Codification is a condition for sharing. Recently Michael Schwab launched the anthology Transpositions: Aesthetico-Epistemic Operators in Artistic Research (Leuven University Press 2018). Transposition as musical concept represents a shift to a different key, to a different range, to something new but still with a clear reference to what you left. How can transpositional logic be of relevance for the format of the findings of artistic result? How do we – or shall we (?) – translate the findings of artistic research so that they both satisfy artistic standards and academic rigour? Michael Schwab: Michael Schwab is a London-based artist and artistic researcher who investigates postconceptual uses of technology in a variety of media including photography, drawing, printmaking, and installation art. He holds a PhD in photography from the Royal College of Art, London, that focuses on post-conceptual post-photography and artistic research methodology. He is the founding Editor-in-Chief of the Journal for Artistic Research (JAR), co-editor of Intellectual Birdhouse. Artistic Practice as Research. (2012), co-editor of The Exposition of Artistic Research: Publishing Art in Academia (2013), editor of the book Experimental Systems. Future Knowledge in Artistic Research (2015) as well as the editor of Transpositions. Aesthetico-Epistemic Operators in Artistic Research. (2018). Theo Barth: Theodor Barth is an anthropologist [dr. philos., 2010] educated at the University of Oslo, with fellowships at the University of Bologna [Institute of Communication/Semiotics], La maison des sciences de l'homme in Paris [École des hautes études en sciences sociales/Semantics]. He did fieldwork in Zagreb and Sarajevo in the mid-nineties. Through his experience from the war-zone he became attentive to the potential of book-building as a form of release, in a sense inspired by Artaud's theatre. Since, he has operated as a fieldworker of 'written practices' in a number of book-projects, focussed on co-authoring, sometimes co-writing, with artists and designers. As a teacher he has been interested in encouraging students to discover writing as a material technique and a working-habit, to enable the them in experiencing for themselves the «joinery» between writing and other material techniques: such as drawing and photography. And from here to discover the steps of book-building. Book-building determines the successive acts of joinery, whereby written, imaged and printed elements mature to become a «fertile soil» for theoretical reflection [NB! not to be confused with book-binding]. It is a method to prepare a foundation for theoretical dialogue, in close interaction with practical work in design and art. 'Reflection' and 'release' are accordingly keywords to his approach to how writing–-when joined to other media–-can feed back but also feed forward in research-driven ways of working with design. He has applied this approach also to academic research projects seeking advice from the arts: e.g. experimental archaeology. Dora Garcia: Dora García is a Professor of contemporary art, an artist, teacher and occasional curator, currently living in Barcelona. EDUCATION: Bachelor studies in Fine Art at the University of Salamanca, Spain, and Master studies in Salamanca and Madrid (University of Salamanca, Círculo de Bellas Artes Madrid). Postgraduate at Rijksakademie voor Beeldende Kunsten, Amsterdam. MAIN ARTISTIC INTERESTS AND RESEARCH AREAS: Performance, theater, literature, psychiatry, psychoanalysis and politics. EXHIBITIONS AND PUBLIC ACTIVITY: Solo exhibition, Index, Stockholm 2009; Lyon Biennale, 2009; São Paulo Biennial, 2010; Solo exhibition, Kunsthalle Bern, 2010; «The Inadequate», the Spanish Pavillion, Venice Biennale 2011; «KLAU MICH», dOCUMENTA(13); Publication of the research cahier «MAD MARGINAL» #1, 2, 3, published respectively by Mousse (2010), Sternberg Press (2011) and Walther König (2012). Currently preparing «MAD MARGINAL» cahier #4; Solo exhibition, cinema screening and public talk at Instituto Torcuato di Tella, Buenos Aires, Argentina, 2014. García is also currently co-director of Les Laboratoires d'Aubervilliers, Paris–a center of artistic production and research dedicated to the cross over of time-based arts and visual arts. Trond Lossius: Trond Lossius is a sound and installation artist living in Bergen, Norway. His projects investigate sound, place and space, using sound spatialisation and multichannel audio as an invisible and temporal sculptural medium in works engaging with the site. He has collaborated with other artists on a large number of cross-disciplinary projects, in particular, sound installations and works for stage. As part of LMW, in collaboration with Jon Arne Mogstad and Jeremy Welsh, he has done a series of installations combining paintings, video, prints, and sound. He has contributed to several productions with the contemporary performance group Verdensteatret, winner of New York Dance and Performance Awards a.k.a. The Bessies 2005-2006 in the Installation & New Media category. He graduated with a master degree in geophysics from the University of Bergen and went on to study music and composition at The Grieg Academy. From 2003-2007 he was a research fellow in the arts at Bergen National Academy of the Arts. Trond Lossius is Head of Research at Oslo National Academy of the Arts, and has previously worked at BEK – Bergen Center for Electronic Arts. He is one of the developers of the software framework Jamoma, and he has ported Ambisonic Toolkit to a set of plugins for the Reaper DAW. He was Norwegian delegate to the European COST action on sonic interaction design 2008-2011. 2012-2013 he was engaged as full professor at Bergen Academy of Art and Design coordinating the artistic research project Re:place. Apolonija Šušteršič: Apolonija Šušteršič has a PhD from University of Lund, Malmö Art Academy, Sweden; and runs her own art / architecture studio practice in Lund, Sweden and in Ljubljana, Slovenia. Recently she was appointed as a professor in visual art at Oslo National Academy for the Arts, to build up the MA studies under title Art & Public Space. Apolonija Šušteršič is an architect and visual artist. Her work is related to a critical analysis of space; usually focused at the processes and relationships between institutions, cultural politics, urban planning and architecture. Her broad – ranging interest starts at phenomenological study of space and continues its investigation into social and political nature of our living environment. She usually makes extensive researches into specific situations found on location, which she uses as a starting point of her project. The result isn't only presented as analytical criticism but it produces in itself already a suggestion for the future. She pursues new possibilities and makes proposals from a hybrid point of view that ranges beyond art and architecture, making socially committed works naturally taking the form of everyday life activity. Her practice is imbedded within interdisciplinary discourse and usually includes collaborations with other professionals such as architects, urban planners, curators, sociologists, and local population. Together with architect and a professor, Meike Schalk she formed an operative unit, which occasionally produces research, projects, actions and discussions. Apolonija Šušteršič participated in a number of internationally published and exhibited projects and exhibitions within and beyond the international contemporary art institutions around the world, like Moderna Museet Stockholm, Berlin Bienale, Luxembourg City of Culture, Moderna Galerija Ljubljana, Marian Goodman, Paris, De Appel, Amsterdam, Generali Foundation, Vienna, Art Museum, University of Memphis, USA, Tirana Biennale 3, Tirana, Muhka, Antwerp, Edinburgh International Festival, Bildmuseet, Umeå, Galerie für Zeitgenossische Kunst, Leipzig, 12th Architecture Biennale, Venice, Artes Mundi 5, among others. Brian Jauhiainen with Olesya Tutova (pianist) and four students from the Opera department. Brian Jauhiainen: American bass Brian Jauhiainen has performed in leading theaters in Europe such as the Berlin State Opera, Deutsche Oper Berlin, Frankfurt, Hamburg, Dusseldorf, Lisbon, Monte-Carlo, Nice, Helsinki, Mallorca, Las Palmas, Opera Hong Kong, Macau International Festival of Music and throughout the United States at NY City Opera, Santa Fe, Florida Grand Opera and Palm Beach. Since leaving the opera stage, Mr. Jauhiainen has become one of the most successful vocal coaches in the world from Opera Australia, Minnesota Opera, Los Angeles Opera to the Norwegian National Opera to New York City. His singers have won virtually every major opera competition in the world and he regularly prepares singers for the leading stages of the world. Since 2011, Mr. Jauhiainen has been the lead vocal instructor at the Norwegian National Opera in Oslo. He has also taught actors at the famed Actors Studio and Broadway singers in New York City. Repertore for Mr. Jauhiainen included: the Commendatore in Don Giovanni with Spoleto Festival in the USA, Opera Columbus, NY City Opera, Portland Opera, Hawaii Opera Theater and Opera Ireland; Il Re in Aida, and Sparafucile in Rigoletto with Orlando Opera; Orlov in the world-premiere of Guest from the Future with the Bard Music Festival; Bonze in Madama Butterfly with Palm Beach Opera , Opera Company of Philadelphia and Baltimore Opera; as well as his debut with the St. Paul Chamber Orchestra in the premiere of Garrison Keillor's and Andrew Stein's comic opera Mr. And Mrs. Olson. Other engagements included Frere Laurent in Roméo et Juliette, and Sarastro in Die Zauberflöte at the Beijing Music Festival; Dvorak's Requiem at the International Festival of Macau; the Bass soloist in the Hong Kong Opera gala; the King in Aida with Opera Nice; and Abimelech in Samson et Dalila with Florida Grand Opera. Mr. Jauhiainen performed frequently in Europe. Notable roles were the title roles in Le Nozze di Figaro, Don Giovanni, Ferrando in Il Trovatore, Commendatore in Don Giovanni, Ramfis in Aida, Frere Laurent in Roméo et Juliette, King Phillip in Don Carlo, Leporello in Don Giovanni and many others in notable venues. He is also the Founder / Manager of Bel Canto Global Arts and he represents singers routinely appearing at the top venues of the world. He is also the Artistic Advisor to Opera Hong Kong. Olesya Tutova: (fortepiano): Currently Olesya is working as assosiate professor and Head of Music of the Opera department in the Oslo National Academy of Arts. Born in Kursk, Russia. In 2003, Olesya graduated from the Moscow State Tchaikovsky Conservatory (under Prof. Mikhail Kollontay) and in 2007 completed her postgraduate studies (under Prof. Pavel Nersessian). Olesya is a prize-winner of International Piano and Chamber Music Competitions. She performed with solo recitals and chamber music repertoire in Austria, Bulgaria, Finland, France, Germany, Greece, Italy, Japan, Kazakhstan, Norway, Poland, Romania, Russia, Spain, Ukraine, United Kingdom of Great Britain. She participated in Aix-en-provence Opera festival (France), Savonlinna Opera festival (Finland), Festival 'Veranos de la villa de Madrid' (Spain), Saaremaa Opera Festival (Estonia), 'Prahova Classic Nights' Festival (Romania), Festival of Contemporary Music (Poland), Xanten Opera Festival (Germany), 58th Wiltz Opera Festival (Luxembourg), and collaborated with Compañía Nacional de Teatro Clásico in Madrid, Teatro Cervantes de Malaga, Heidelberg Theatre, Oslo Opera House, Warsaw National Opera and Theatre Wielki, Wrocław Opera House, Lodz Theatre, Poznan Theatre, Cracow Philharmonic, Lublin Musical Theatre. Olesya was Member of Jury of the VII and VIII International Young Piano Competitions "The Golden Talents of The Commonwealth of Independent States", Russia. In the academic word, since she had her PhD with the thesis "Michael Kollontay. Portrait of Musician", she has published some articles and the book based on the theme of her thesis. Common Craft was a reciprocal mail-art research and teaching project run in 2018 between staff and students of the Art and Craft Department, Oslo National Academy of Arts and Illustration specialism, Glasgow School of Art. The aim was to examine local and disciplinary practices of drawing and print in separate locations–-and how they might usefully collide within the work of students reviewing their practice as they began their professional lives as practitioners. Over the course of the year parcels were sent via air mail between the institutions initiating a call and response series of artworks. In addition to staff exchange between the institutions we also ran a joint intense workshop in Glasgow mid-way through, when the students met each other for the first time, collaborated in drawing outputs and in curating a work-in-progress show. From simple starting conditions, this project generated exceptionally complex and thought-provoking debates and outcomes for both staff and students involved. Examining the works produced, alongside the suitability of print and drawing as mediums for material exchange, this talk will address the themes of translation and disjunctions of distance raised by the act of repeatedly attempting to send parcels of art, via mail, from one institution to another. Edwin Pickstone (b.1982, Manchester, UK) lives and work in Glasgow. Focusing on the material nature of print Pickstone uses letterpress technology, collaborating with artists and designers on a wide range of projects. His work spans academic, artistic and design worlds, with particular interest in the history of typography, graphic design, the nature of print and the book. He is currently Lecturer, Typography Technician and Designer in Residence at The Glasgow School of Art, where since 2005 he has cared for the school's collection of letterpress printing equipment. He has spoken and exhibited internationally. See the bios in the section about the Touching the World Lightly exhibition. 15:30: Discussion on Drawing. Panel discussion with Frances Robertson, Edwin Pickstone, Philippa Lyon, Duncan Bullen and Jane Fox. Four very different practitioners from KHiO will present films in relation to their recent research. Jeannette Christensen, a visual artist working primarily with installation, sculpture and photography, will screen a film from her current project entitled An Aesthetics of Interruption. Artist Liv Bugge will present her recent short film, To accept theirs, to make it mine, to wish it for myself (2018), based on a workshop for a group of prisoners organised together with choreographer Brynjar Bandlien. And graphic designer Maziar Raien will introduce a short film by a former colleague from the London Filmmakers Cooperative, John Smith's Associations (1975). All four will be present to discuss their work with writer and curator Mike Sperlinger. Liv Bugge lives and works in Oslo (b. 1974) She studied at the Royal Academy of Fine Arts in Oslo and HISK (Higher Institute for Fine Art) in Belgium. Liv Bugge's artistic practice incorporates a variety of media, with emphasis on video. Bugge is interested in aggression as both a constructive and destructive force in society. Many of her works are disrupting the borderline between past and present, perpetrator and victim and between facts and fiction. Her research as a fellow at the Oslo National Academy of the Arts is questioning normative structures within the Scandinavian welfare-state, with focus on what the embodiment of such mechanisms of control of and government does to the contemporary subject. Bugge also runs the artist-run platform FRANK with Sille Storihle. FRANK is an Oslo based platform, established to nurture art and critical discourse revolving around gender issues, desire and sexuality. The platform operates in different locations and with various co-curators. The aim is to build a community and create discussions that address the hegemonic structures in society. The first FRANK event took place in an old attic in St. Olavs gate in Oslo on April 15, 2012. Brynjar Åbel Bandlien (1975) trained ballet in his native Norway and at the Hamburg Ballet in Germany Bandlien worked as a modern dancer for Netherlands Dance Theatre 2 in Den Haag with which he toured Europe, the US and South-Africa. In 1998 he started to work as a freelance dancer in Scandinavia, Europe and the US working with artists such as Philipp Gehmacher, Raimund Hoghe (dramaturg of Pina Bausch), Vera Mantero og Antonija Livingstone. He has also presented his own work at Black Box Theatre, Dansens Hus Oslo and Henie Onstad Kunstsenter and at festivals in Brussel, Bologna, Belfort, Bucharest, Berlin and New York. Currently he is a PhD fellow of artistic research at Oslo National Academy of Art in Norway. Maziar Raein is an Associate Professor at the Oslo National Academy of the Arts (KHiO). He holds a BA (Hons) in Fine Art and an MA in Independent Film from St.Martin's School of Art (later known as CSM). His film work include; Underwater Productions which specialized in arts documentaries and short dramas with commissions from Channel 4 and F.4 Films which made I Used To Be In Pictures. He later founded Codex Design were he was responsible for the branding and identity of many businesses, amongst them Lastminute.com. His company specialised in developing identities and distilling them into brands. Before moving to Oslo, he taught on the BA Graphics course at CSM, were he was Head of the Context programme. He has published and worked on projects that focus on the positive aspects of visual and spatial ability, reflective practice and methodology. Moreover, he was a regular contributor to Graphics magazine, as well as having works published in; Typographics, Eye magazine etc. On moving to Oslo he established the MA Design course at KHiO, setting up a number of research forums that focused on the development of teaching and learning in design. He was also founding partner in Writing Purposefully in Art and Design (Writing-PAD) – alongside Julia Lockheart, which was recognised as a landmark research project by the Higher Education Funding Council (HEFCE-FDTL) in developing models of writing creatively in art & design – Writing PAD went on to establish the Journal of Writing in Creative Practices. More recently, he has become the Director of the Oslo National Academy of the Arts Typographic Archive researching the role of typographic archives. His current research projects include Radical Interpretations – a research programme that seeks to reinterpret iconic musical works for percussion, within the context of audience engagement. He is also a Senior Advisor in Research to the Centre of Excellence in Music Performance Education (CEMPE). Jeannette Christensen: Since the early 90's, Jeannette Christensen has been working on installations, sculpture and photography, where a discussion about the concept of sculpture, time and materiality has been continuous. Quoting, appropriating and combining aspects from art history with the contemporary, arts place and presence in society are recurring interests. She works idea-based and not limited to specific media, but in a wide range of materials and techniques. She believes in a dialogic understanding of how we establish ourselves as individuals or subjects. We recognize ourselves and our passions through an already existing language conveyed by culture, through the voices of others. One exists perpetually in a dialogue that transcends past and present. Christensen is Professor of Contemporary Art at the Academy of Fine Art, KHiO. Christensen will screen a film from her current artistic research work titled an Aesthetics of Interruption, more specifically "Woman Interrupted" 2018. This will be followed by a short talk with Mike Sperlinger. Mike Sperlinger (b. 1977) lives and works in Oslo and London. He is a writer and curator and holds a position as Professor of theory and writing at Oslo National Academy of the Arts. Mike studied English Literature (BA, Sussex) and Aesthetics & Art Theory (MA, Middlesex), and in 2006-07 he was a Helena Rubinstein Curatorial Fellow at the Whitney Independent Study Program in New York. As a writer he has contributed to a variety of publications including Afterall, Art Monthly, Dot Dot Dot, Frieze, Radical Philosophy and Texte zur Kunst, as well as catalogue texts for artists including Keith Arnatt, Ursula Mayer, Laure Prouvost and Hong-Kai Wang. He has also worked extensively as an editor, with projects including books on early conceptual art (Afterthought, 2005) and artists' cinema (Kinomuseum, 2008); issues of Will Holder's eclectic journal of writing and art FR David; and, together with the artist Christian Flamm, a critically-acclaimed fanzine (Foxtrot Echo Lima Tango, 2010) about the 1980s British band Felt. In 2002 he co-founded LUX which drew on the legacy of the London Filmmakers' Co-operative and other artist-run organisations. During more than a decade as assistant director he developed the distribution of LUX's film and video collection. As well as many screenings and exhibitions for LUX, he has curated other projects independently including the group show «Let's Take Back Our Space» (Focal Point Gallery, Southend, 2009) and German artist Marianne Wex's exhibition at the Badischer Kunstverein, Karlsruhe (2012). Welcome to a concert with PhD Candidates Christian Kjos and Sara Elisabeth Holmertz from the Norwegian Academy of Music. The concert will take place in Ane Thon Knutsen’s exhibition. Four artists and professionals engaged at Oslo National Academy of the Arts have been challenged to invite a peer/colleague to a dialogue about their practice. Based on previous years' experience at the Artistic Research Week, these conversations have proven to be fruitful for the dialogue partners and the audience. Lisa Charlotte Baudouin Lie er utdannet fra blant annet Stockholms Dramatiska Högskola, Dans och Cirkushögskolan (DOCH) og Høyskolen i Østfold, Akademi for Scenekunst Dans. Hun er scenekunstner, regissør, skuespiller, dramatiker og forfatter. Pony of No Return (PONR) er Lies skiftende plattform av kunstnerisk medvirkende og samarbeidspartnere der Lie er kunstnerisk leder. Med PONR og tidligere med performanceteaterduoen Sons of Liberty, har hun hatt stor innflytelse på norsk scenekunst gjennom en blanding av pop-kultur, trash og misantropisk ærlighet. God Hates Scandinavia: Sons of Liberty 3 ble tildelt Morgenbladets Gabler-pris for beste forestilling 2006. Forestillingen Blue Motell som spilte på Trøndelag Teater og Black Box teater våren 2013, ble nominert til Ibsenprisen 2014. Lisa Lie vant Heddaprisen for Særlig kunstnerisk innats 2015. Blue Motell var i tillegg nominert i kategoriene Beste mannlige medspiller og Beste Scenetekst. Lisa Lie var husdramatiker ved Dramatikkens hus i perioden 2014-2016. Itonje Søimer Guttormsen (f 1979) jobber med film og performance. Hun har en BA i filmregi fra Den Norske Filmskolen (2008) og en MAF i filmiske prosesser fra Akademin Valand (2017), i tillegg til emner i teater, musikk, kunsthistorie og teologi ved Universitetet i Oslo. Itonje var sist aktuell med novellefilmen «Retrett» (2016) som bl.a mottok filmkritikerprisen ved Kortfilmfestivalen i Grimstad, og hadde sin utenlandspremiere ved International Film Festival Rotterdam. I 2015 oppførte Itonje den rituelle performancen «Eden, Oslo – en konfirmasjon» hvor 11 kvinner konfirmerte seg i Lilith; Adams fortrengte første partner. I 2017 bearbeidet hun den grufulle mottakelsen av Vibeke Løkkebergs debutfilm «Åpenbaringen» i utstillingen «LIlithistic Revelation» ved Fotogalleriet. Hun er bakkvinne av visningskonseptet ByFLimmer og KORET. Itonje er pr dags dato i produksjon med langfilmen Burning Man, og i utvikling av det langdrøye spelet «Sangen om Isfolket», i samarbeid med Lisa Lie og Aina Villanger. Toni Kauppila: Professor and architect Toni Kauppila is the Head of the Interior Architecture and Furniture Design at Oslo National Academy of the Arts in Norway. He also runs his research-based Architectural Practice ND. He has been teaching since 1999 in several international universities including at Aalto University in Helsinki and as a guest Professor at TAMA Art University in Tokyo. Kauppila's approach is to closely connect research, teaching, and practice into an ongoing laboratory for developing the social and entrepreneurial approaches emerging from the architectural and design processes. He has founded a research unit 'School for Unforced Errors' for exploring these New Practices. Kauppila's work has been awarded internationally. His clients include among others fashion brand Marimekko and forestry company Stora Enso. Ane Graff: Ane Graff (b. Bodø, Norway, 1974) lives and works in Oslo, Norway. She graduated from Bergen National Academy of the Arts in 2004 and currently holds a position of research fellow at the Oslo Academy of Fine Art. Recent exhibitions include "Soon Enough: Art in Action", Tensta Konsthall, Stockholm (2018); "Myths of the Marble", Henie Onstad Kunstsenter, Oslo, and the Institute of Contemporary Art, Philadelphia (2017); the 11th Gwangju Biennale "The Eighth Climate (What Does Art Do? )", Gwangju (2016); and "Surround Audience -The New Museum Triennial 2015", NY (2015). Graff is part of the upcoming exhibition "Weather Report –Forecasting Future", at the Nordic Pavilion at the 58th Venice Biennale (curated by Leevi Haapala and Piia Oksanen from KIASMA). Ane Hjort Guttu (b. 1971) is a Norwegian artist and filmmaker based in Oslo. She works in a variety of media, but has in recent years mainly concentrated on film and video works, ranging from investigative documentary to poetic fiction. Among recurrent themes in her work are the relationship between freedom and power, economy and the public space, social change and limits of action. Guttu is also a writer and curator, and she is a professor at the National Academy of the Arts, Oslo. Jorge Manilla: By creating jewellery Jorge Manilla investigates his environment - religion, emotions, relationships and the meaning of life. Over the last years the artist has rediscovered his love for the black colour. To the artist black relates to something hidden, the secretive and the unknown, and as a result it creates an air of mystery. It keeps things bottled up inside, hidden from the world. His dark forms and shapes create a barrier between the meanings of the objects and the outside world. Black implies self-control and discipline, independence and a strong will. It gives an impression of authority and power. For Manilla black is the end, but the end always implies a new beginning. When light appears, black becomes white, the color of new beginnings. Sofia Björkman is a jewellery artist from Stockholm in Sweden. After graduation from Konstfack 1998 she started PLATINA, a gallery and studio for contemporary national and international jewelry art. Since then she has been working with jewellery art, as an artist, as a gallery owner and as a curator combined with all kinds of activities and projects within the jewellery field. She is exhibiting international as for example in Europe, USA, Brazil, New Zealand, China and more. She cooperates with artists, curators, galleries, museums and institutions around the world, give lectures and workshops and is a board member of the international organization AJF- Art Jewellery Forum and Konsthantverkscentrum, the Swedish Arts and Craft Center. Registration required. Sign up for Part 1 or Part 2, or both. (Max 20 people in each of the parts). Sign up by sending an email to amansteg@khio.no. This two-part workshop emerges from the Amphibious Trilogies project (led by Professor Amanda Steggell) and lands somewhere between design fictioning, choreography and dance. 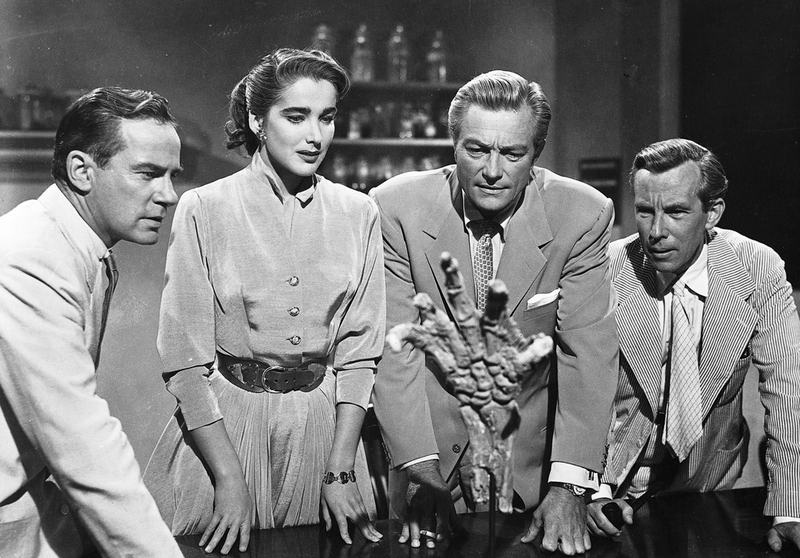 Together, we will enact a short sequence from the movie "Creature from The Black Lagoon" (1954) and learn to do The dance of evolution, from the big bang to crawling out of the sea and onto dry land. Amanda Steggell is Professor of Choreography at the Academy of Dance, Oslo National Academy of the Arts and is the project leader forAmphibious Trilogies. Amanda studied dance (London College of Dance and Drama) and choreography (National College of Ballet and Dance, Oslo). In 2003-06 she was Fellow of the National Programme for Research Fellowships in the Arts at the Norwegian Theatre Academy, Østfold University College, where her subject was synaesthesia and contemporary live art practices. Since the mid 1990's, when she also co-founded the live art project Motherboard (1996-2008), Amanda has investigating how a body copes with information flowing between digital, natural and lived worlds, grappling with how these flows affect perceptions of time, space and place. The outcomes have taken on many live forms, from performances and installations in the black box and white cube to interventions in urban, rural and marine environments. Brynjar Åbel Bandlien is a PhD-fellow at the Academy of Dance, Oslo National Academy of the Arts and a member of the Amphibious Trilogies project. Brynjar Åbel Bandlien (1975) trained ballet in his native Norway and at the Hamburg Ballet in Germany Bandlien worked as a modern dancer for Netherlands Dance Theatre 2 in Den Haag with which he toured Europe, the US and South-Africa. In 1998 he started to work as a freelance dancer in Scandinavia, Europe and the US working with artists such as Philipp Gehmacher, Raimund Hoghe (dramaturg of Pina Bausch), Vera Mantero og Antonija Livingstone. He has also presented his own work at Black Box Theatre, Dansens Hus Oslo and Henie Onstad Kunstsenter and at festivals in Brussel, Bologna, Belfort, Bucharest, Berlin and New York. Currently he is a PhD fellow of artistic research at Oslo National Academy of Art in Norway. Andrew Morrison is Professor of Interdisciplinary Design at the Institute for Design, Oslo School of Architecture and Design where he is the Director for the Centre for Design Research and a member of the Amphibious Trilogies project. Hans-Jørgen Wallin Weihe is Professor of Social Work at the Faculty of Education, Inland Norway University of Applied Sciences and a member of the Amphibious Trilogies project. 10:00–17:00: Workshop: Performative Research: autoethnographic approaches to artistic research. With Per Roar, Camilla Graff Junior, Luisa Greenfield, Myna Trustram. Continues on Friday at 13:00. The two-day session Performative Research comes out of a collaboration between Camilla Graff Junior (performance artist, Copenhagen), Luisa Greenfield (Berlin-based visual artist and PhD candidate at the University of Plymouth), Myna Trustram (writer, Manchester School of Art), and Per Roar (choreographer and professor in choreography at KHiO). We have different disciplines but we share an interest in the performative and how it can be used as a method of enquiry and a vital form for presentation of research. Our contribution will begin with four individual approaches to artistic research and culminate in the collective performance lecture Are you still there? -four approaches to the journal, which was most recently presented at the Society for Artistic Research (SAR) 9th International Conference at the University of Plymouth on April, 2018. We will combine the presentations of autoethnographic approaches to artistic research with moderated conversations with the audience as an entry point to discuss artistic research strategies and the value of a researching performer and performative research. Camilla Graff Junior is a performance artist. She holds a double Master's degree in Performance Studies from Université Sorbonne Nouvelle in Paris and the University of Copenhagen, and her projects are situated in the intersections between visual art, creative writing, narrative, feminist theory, archive and affect. In the performance Journals she reactivates her memory and revisits different moments of her life, emotions and thoughts together with the present audience. The project takes its starting point in an investigation of her old journals, twenty-seven handwritten notebooks conceived in Danish, her native language, from June 11th 1988 until today. Luisa Greenfield is a Berlin-based visual artist and a PhD candidate in Art and Media at the University of Plymouth, UK where her practice-based research seeks to expand the function of the essay film by considering it a form of thought capable of offering resistance against an accelerated, future-oriented perception of history. Luisa is an active member of the Labor Berlin film collective and her work is shown internationally. Per Roar is a choreographer and artist-researcher who merges a socio-political interest and contextual enquiries with a somatic approach to movement. He is professor in choreography and Head of the MA Programme in Choreography. In recent years he has been engaged in collective artistic works, such as Seminarium (2012-2016), By Carte Blanche (2016), and Are you still there? – four approaches to the journal (2013/2018). In his current artistic-research, he is engaged in a choreographic enquiry into the politics of remembrance and representation. The enquiry departs from his doctoral project Docudancing Griefscapes which he defended at the University of the Arts Helsinki in 2015. Myna Trustram: For twenty-five years Myna Trustram worked in galleries and history museums in England as a curator and researcher. In 2013, she joined Manchester School of Art (Manchester Metropolitan University) where she runs the doctoral training programme in arts and humanities. She has published (2011 – 2017) academic works within history and museology. She has recently turned to experimental writing of non-fiction. Her projects move between themes of loss, memoir and museums, they are all framed within a practice as research and psychosocial perspective. "What does it mean to draw 'presence'? In this workshop, we will invite you to focus on your sense of touch and to try some approaches to drawing the moment and reflecting on what collaboration might mean to your practice." Presentation of VIS # 1 by member of the Steering Committee Cecilie Broch Knudsen and Darla Crispin. VIS # 1 – Risk in Artistic Research – jeopardy or validation? VIS # 1 will have 9 expositions on the theme of Risk. Risk – and associated topics such as vulnerability, unguardedness, precariousness, failure and uncanniness – are frequently raised as concerns within artistic research arenas. Less common is the opportunity to go beyond merely reflecting upon subjective associated effects and, instead, to try to understand the wider implications of embedding elements of risk within the matter and material of art-making itself. Issue 1 of VIS seeks to provide such an opportunity; the starting premise of this issue is that risk may be regarded not merely as a subjective perception, but also as an aspect of the material that is essential to the nature of artistic research and art-making itself. All participants at the Artistic Research Week 2019 are invited to an informal de-brief with the aim to assess the program, the themes and the formats of the Artistic Research Week 2019. What should be done next year? The space will be organized as a social arena and brunch (coffee/tea, orange juice, croissants, wheat rolls) will be served from 10.30. This project is part of a collaboration into artistic research between KHiO-Design entitled MONO.DUO.DIO.POLI.META.LOUGES with (Maziar Raein & Næss Lysestøl) and Minerva Academy-Design (Michiel Johannes Jansen & Harold Koopmans). Staff and students from Minerva have travelled over from the Netherlands to exhibit, share and discuss their project at KHiO’s Research Week. Try Out Opera: Based on investigation and using a composed system of notation and experimentation, what could a reinterpretation of a trans-disciplinary project that questions a pedagogical situations look like? In the exhibition different personal collections will be presented, contrasting a low key Dutch ‘free’ market’ and a highbrow staged reality. The constant alternating of multidisciplinary settings will question the ‘regular’ meaning of the objects and collections. In doing so we aim to provoke new insights. Students and teaching staff from Minerva, Groningen will work with different collections in a theatrical setting researching materials and the possible outcomes at the same time: Try Out. This project is a continuation of the previous “Try Out” exhibition at Minerva, Groningen and the dyptich at Grand Theatre, Groningen and MARE in Milano during the Salone di Mobile. Bob Verheijden is Head of Department of Design at Minerva Art Academy. The Department of Design offers (interdisciplinary) programs in Product Design, Time Based Design, Illustration & Animation Design, Graphic & Interaction Design, Interior Architecture & Design and Off-Road Design. He graduated in 1987 at the Arnhem Academy of Arts ABKA (ArtEZ) in product design. Verheijden worked in industry as designer and director in cross-disciplinary collaborations in architecture, interior design, scenography, urban architecture and multimedia design. One of his fields of interest is how (collections of) existing, and new objects and things can become meaningful and contribute to a better understanding and sustainable world. Michiel Johannes Jansen was from the very beginning until 2009 as a maker attached to the Dutch theater collective 't Barre Land in Utrecht. In 2009 Jansen founded Overmorgenland and made with writer Sanneke van Hassel and actress Veerle van Overloop the successful performance Blaarkoppen. In 2012, he directed the large location theater performance Happiness that was based on Chekhov's short stories. With Onix architects Jansen developed in 2013 the smallest theater in the form of a cube of 6x6x6 meters with the title: Poplart. He lives and works in Zeerijp in The Netherlands. Tale Næss (1969) is an award-winning playwright, dramaturge and author living in Tromsø and Oslo. Næss works across the field and often in interdisciplinary constellations. Næss has written novels, plays, poetry, librettos and prose. She has a master in film science. Her work has been produced and performed nationally and internationally. Maziar Raein is Associate Professor at The Oslo National Academy of The Arts where he established the MA in Design and formally was the Head of Context in Graphic Design at Central Saint Martins College, London. He founded Codex Design has been responsible for many leading on line brands including Lastminute.com and has been a contributor to Graphics magazine, as well as having works published in Typographics, Eye magazine etc. He has been involved in letterpress research since the late 1990s. 14:15–15:30: Moderated conversation based on the performance lecture and yesterday's presentations on issues related to researching performers/performing researchers and the concept of performative research and autoethnographic approaches to artistic research. Performance by Janne-Camilla Lyster in relation to Ane Thon Knutsen's installation at Kunstnernes Hus.